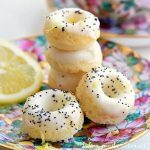 Mini Lemon Poppy Seed donuts are bursting with lemon flavor! Spray mini donut pan with non-stick spray. Add buttermilk, egg and butter; tp the dry ingredients and stir mixture until it is combined. Use a piping bag to fill each donut cup about 1/2 full. Bake for 4-6 mins or until the top of the doughnuts spring back when touched. Cool in pan 5 mins minutes then remove and let them finish cooling on a rack. For the glaze slowly add the milk one tablespoon at a time to the confectioner's sugar until you reach a soupy consistency. Once the donuts are completely cooked you can dip them into the glaze and then sprinkle them with poppy seeds.